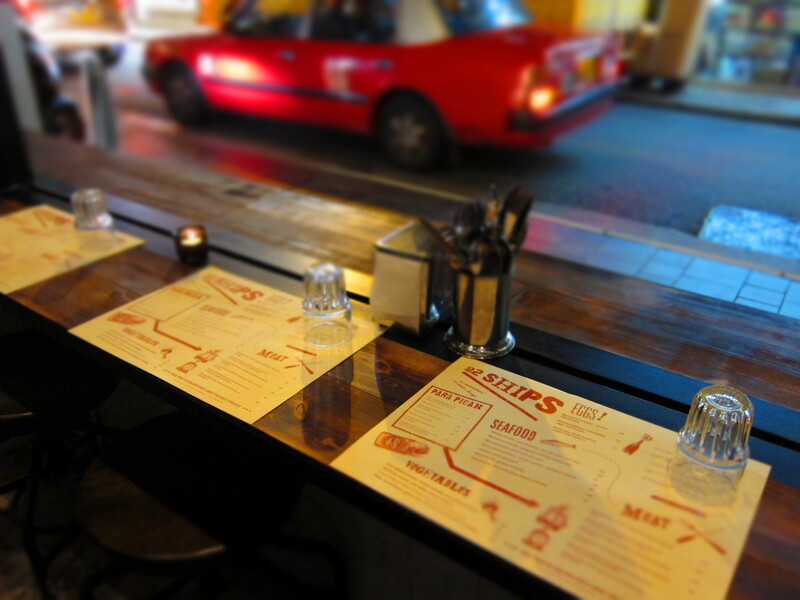 The tide of Mediterranean restaurants continues with Tapas a’Peel which, as the name suggests, is in the vicinity of Peel Street in Soho, overlooking Pak Sze Lane Park. If Rach and I had known this beforehand, we wouldn’t have spent a very sweaty ten minutes walking up and down Peel Street in utter confusion, so take note! 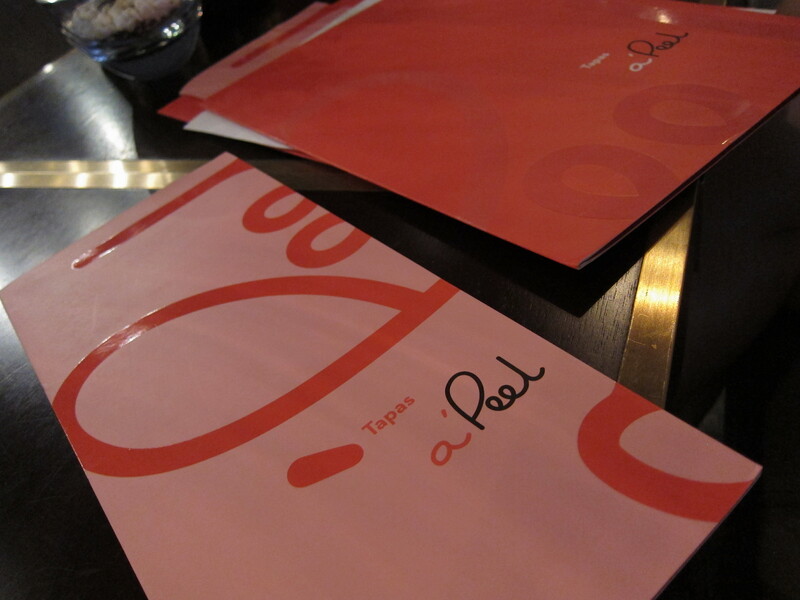 Tapas a’Peel serves tapas dishes not only from Spain, but also Greece, Italy, Turkey and Morocco. All the plates are created for sharing and the emphasis is on fresh ingredients and simple but tasty recipes. As it is just off Peel Street, the restaurant has in fact, a very peaceful ambience and makes it ideal for cosy meals with friends and family. The decor is rustic and warm, with soft lighting and a homely Mediterranean feel. Their lunch set is great value at $88 per person for an Appetizer Platter of Mixed Salad, followed by a Daily Pasta, coffee or tea. If you prefer, for an additional $40, you can opt for their Wood-fired Pizza Margarita. 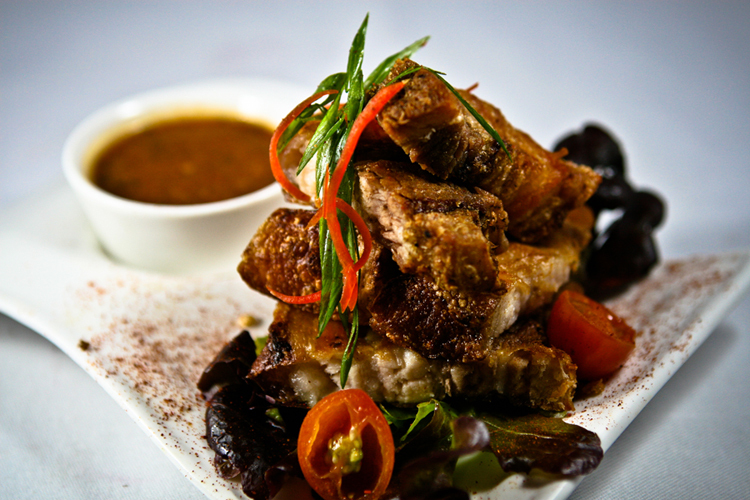 But it’s their a la carte menu that is attractive, with a range of dishes from various regions of the Med. Rach and I started by tucking into their Garlic Loaf with Rosemary and Sea Salt that was freshly baked, wonderfully warm and aromatic. 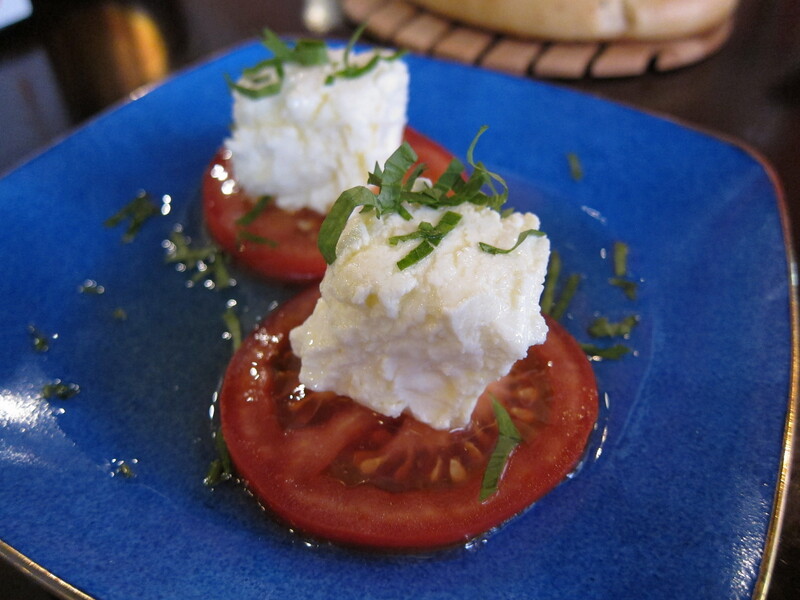 I loved that they serve it with extra-virgin olive oil, balsamic vinegar and garlic with a garlic grater to season to your taste. 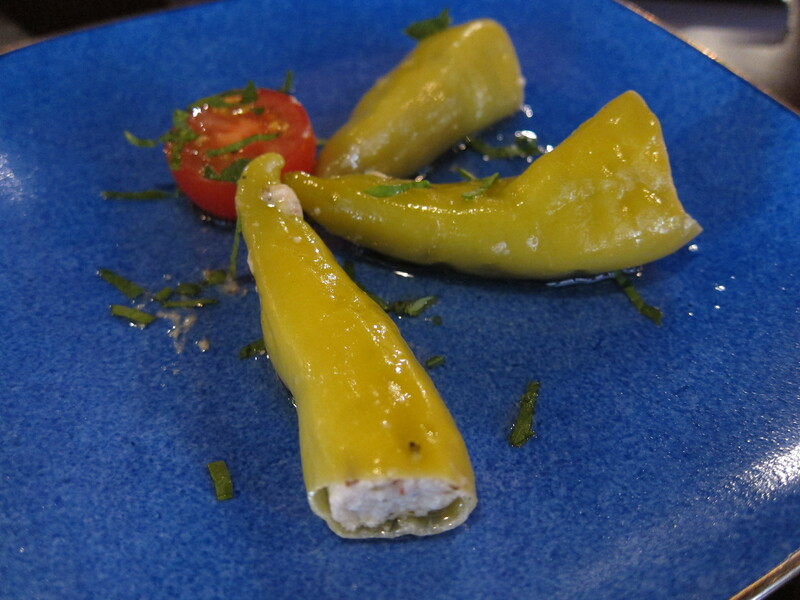 Feta cheese and goat cheese lovers will adore their stuffed small green peppers and the creamed Goat Cheese in olive oil- both delicious yet simple dishes. 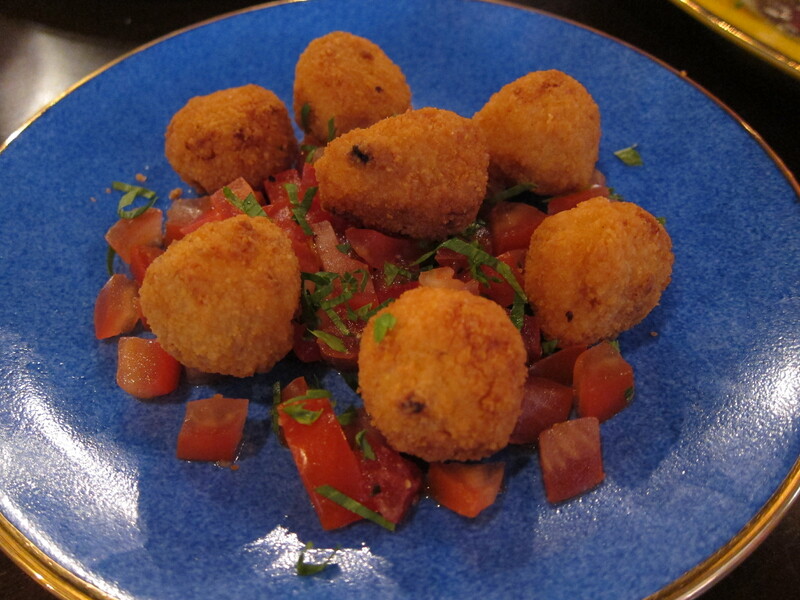 Their dried Spanish Chorizo was wolfed down followed by the moreish Jamon Iberico Croquettes that were all too easy to pop into one’s mouth. 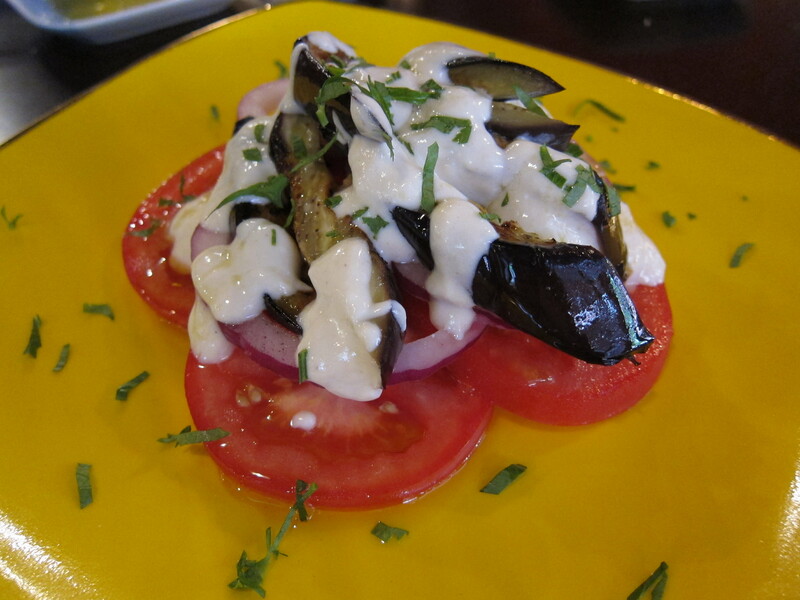 The Moroccan Salad with Eggplant, vine tomatoes, red onions and Tahini Yoghurt dressing was light and clean tasting- the Tahini dressing, just mildly piquant to add a touch of zest to the dish. I was surprised by how much I enjoyed the mains we had. 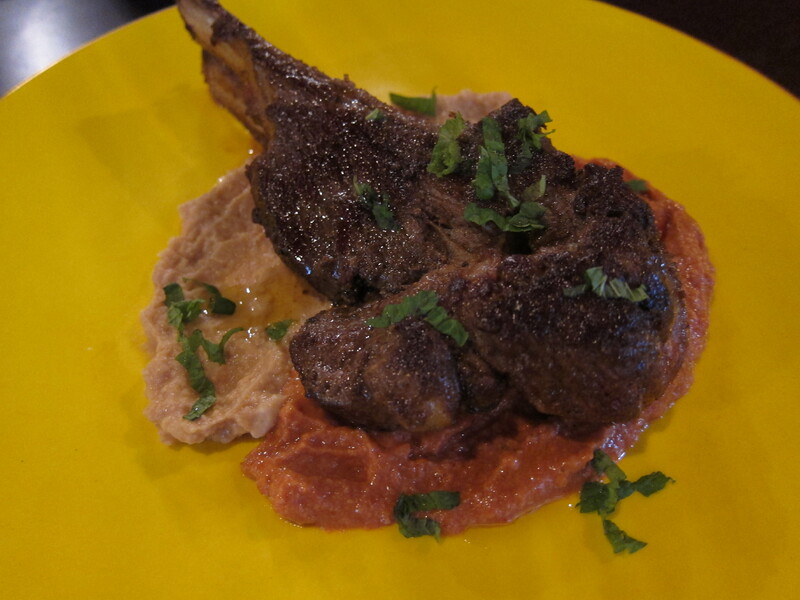 Their Grilled Lamb Shoulder Chops in Moroccan Marinade was exquisitely done and a fairly generous size, enough to fill oneself up without all the preceding tapas! The marinade was delicious and had to be mopped up by the remainder of the bread and also by my favourite dish of the meal, the Gambas Pil Pil, or King prawns in a spicy chilli olive oil with lashings of garlic. 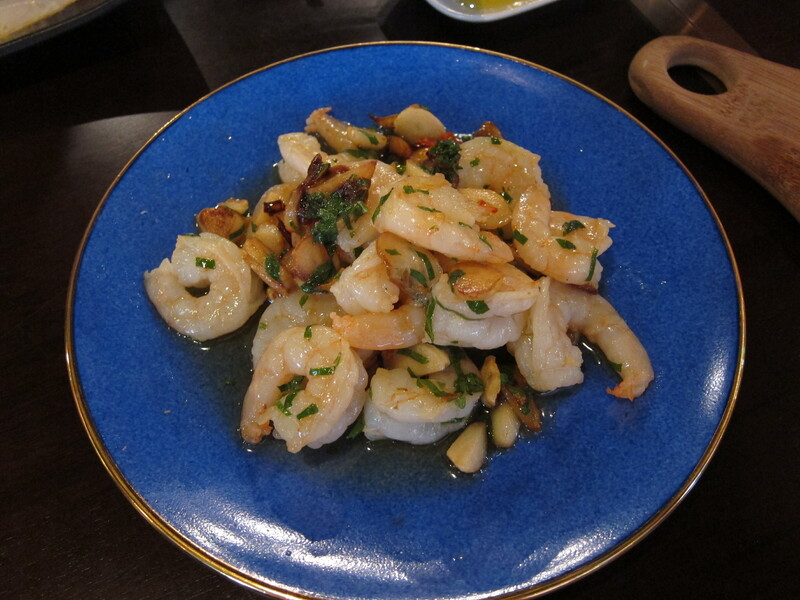 The prawns were fantastically fresh and I love nothing more than still crispy fried garlic slices. 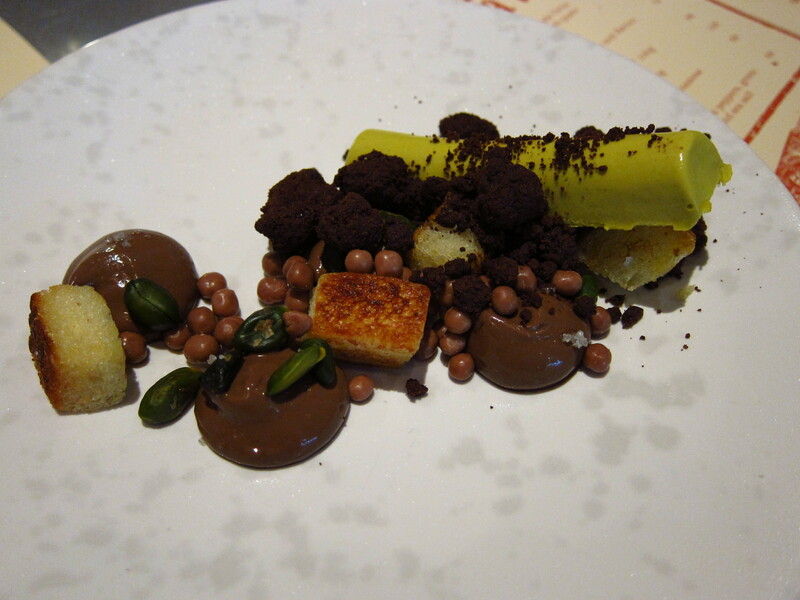 Here was a dish that fully reflected Tapas a’Peel’s concept of simplicity and allowing the food to ‘speak for itself’. Prawn addicts beware, you could find yourself ordering more than one plate! Desserts are few in number but their Chilled Walnut Cream with Caramelized Walnuts and Frangelico Liqueur was delightful, if not a tiny bit too rich after everything we ate. 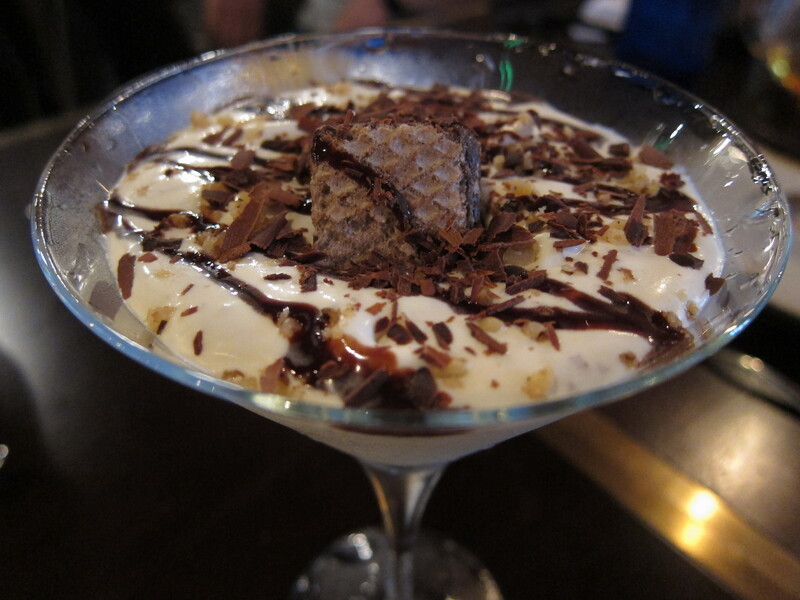 But the silky smooth cream and a medley of nutty flavours won me over and I made a sizeable dent in the pudding! 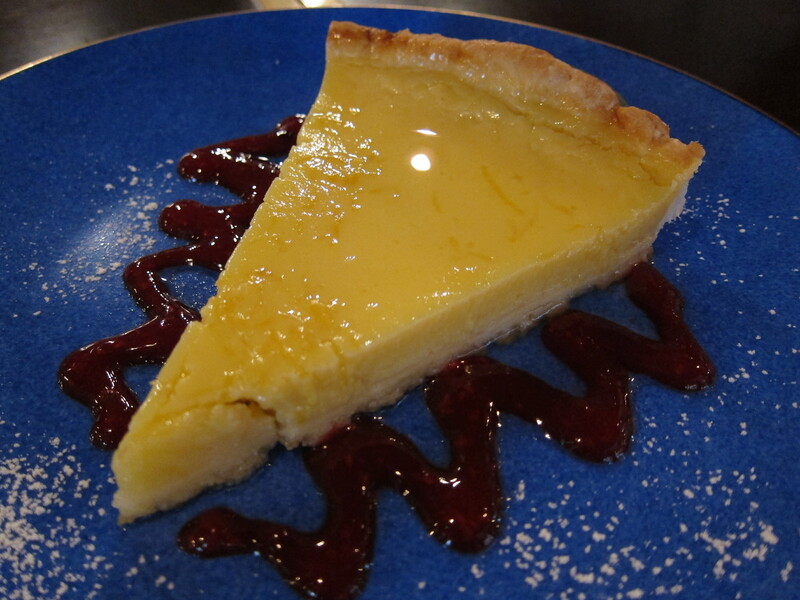 Their home made Lemon tart had all the flavours and potential of being a truly great tart, if it weren’t for the biscuit base being on the soggy side due to an overly moist lemon curd. I do believe though that this will improve. 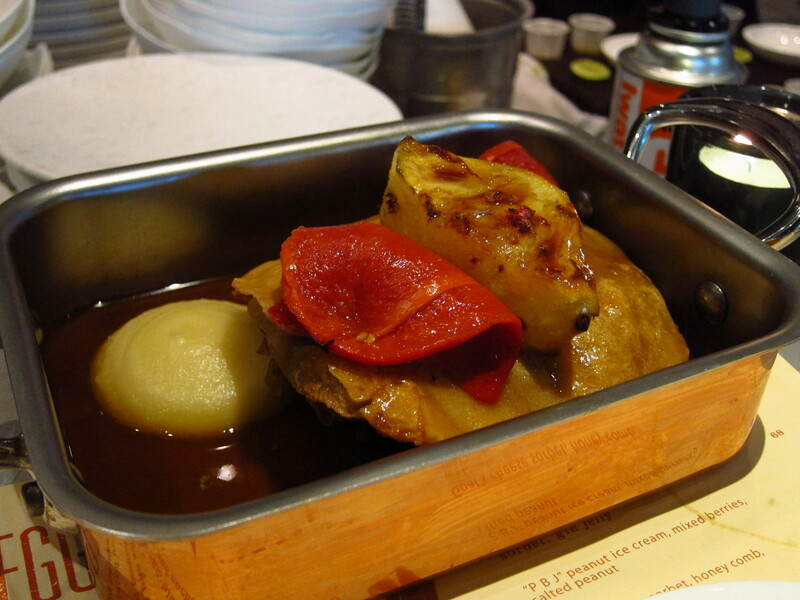 Even though Tapas a’Peel is one in a long list of ever emerging Spanish restaurants, the real appeal of this establishment is the back to roots approach of letting the ingredients shine through without too much fuss over presentation and the need for dishes with a twist. I certainly know that I will be back for more of their wholesome dishes. This review was done on behalf of Sassy HK and can be read here. Categories: Mediterranean, Middle Eastern, Spanish | Tags: Central, Chorizo, Hong Kong, lamb, Mediterranean food, Moroccan Salad, Peel Street, sharing plates, Spanish food, Spanish Tapas, Tahini, Tapas, Tapas a'Peel | Permalink. Get out your fans because it’s Español Fever in Hong Kong right now. 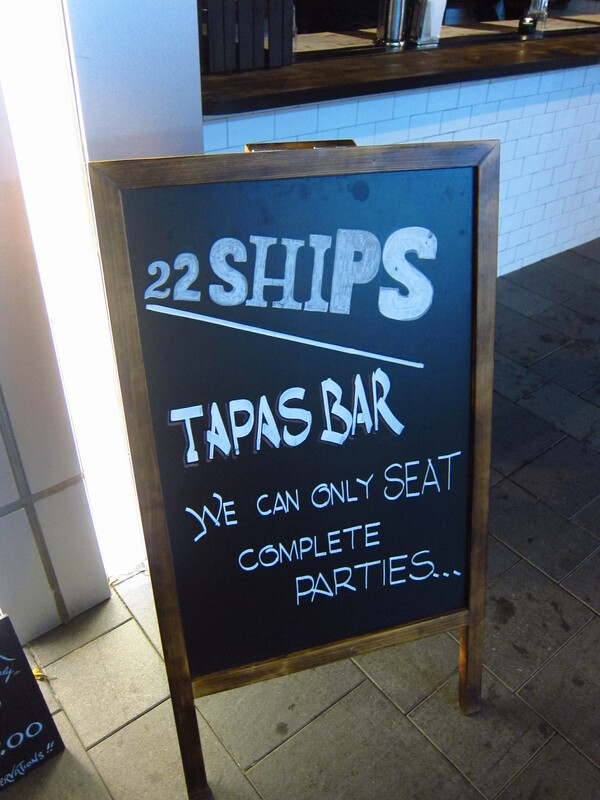 We’re experiencing an influx of Spanish eateries and some will be muchos excited to learn that the most hotly anticipated in recent weeks is Brit celebrity chef, Jason Atherton’s 22 Ships. Chef Atherton, of Pollen Street Social Fame, protégé of Ferran Adrià and Gordon Ramsay has brought to the streets of Wan Chai, not only the culinary kudos, but also a refreshing, modern spin on Spanish tapas classics. 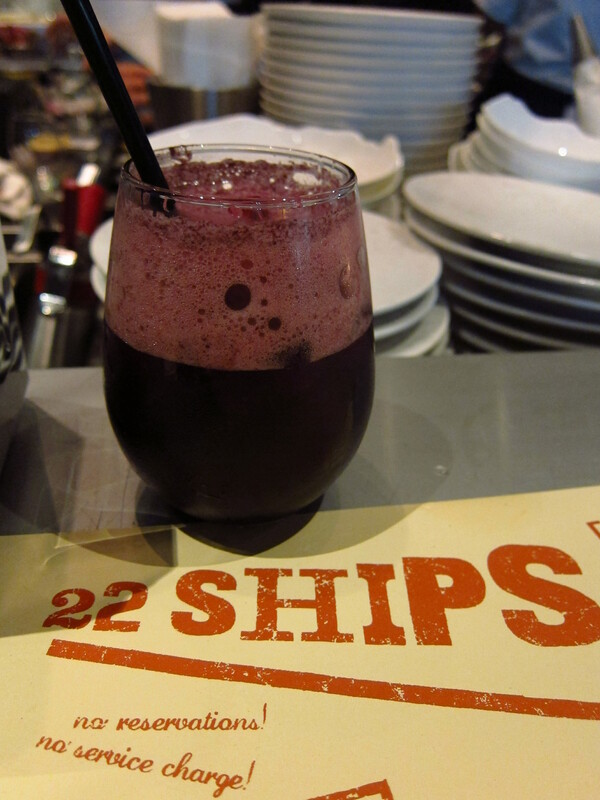 22 Ships is a hip, laid-back establishment. Due to its compact size (35 seats), black and white minimalistic décor and an open layout lessen the feeling of confinement. The exposed front with counter seating and the capacity to spill out on to the street for nibbles and casual drinks gives an air of Spanish al fresco dining. 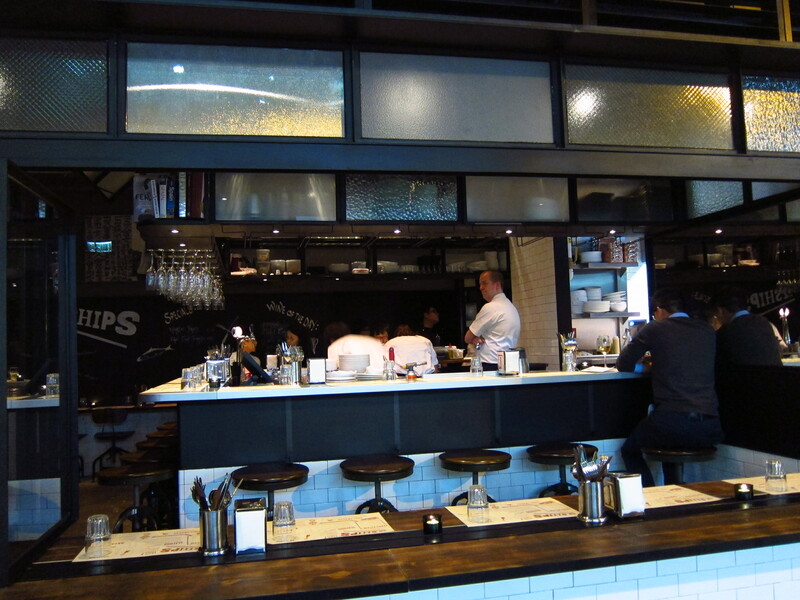 Best seats are at the bar around an open kitchen for diners to observe and be entertained by the food preparations. The no reservation policy seems to be de rigour at the moment and I can certainly recommend going as early as possibly to avoid disappointment and possible starvation, as 22 Ships has yet to establish a table time-limit. Our party of four were determined to not be kept waiting so we arrived promptly at opening time and snagged ourselves a kitchen view at the bar. The only splurge of colour in the restaurant comes from the vivid red font on our menus which display a concise array of para picar, meat, vegetables, eggs and desserts. As the four of us were ravenous, we chose something from each category, including four meat dishes, before settling into our bar stools with a sangria in hand. Interestingly, the sangrias looked a little like raspberry smoothies topped with foam, but it was then explained that the sangria is concocted as normal but injected with air to create this effect. 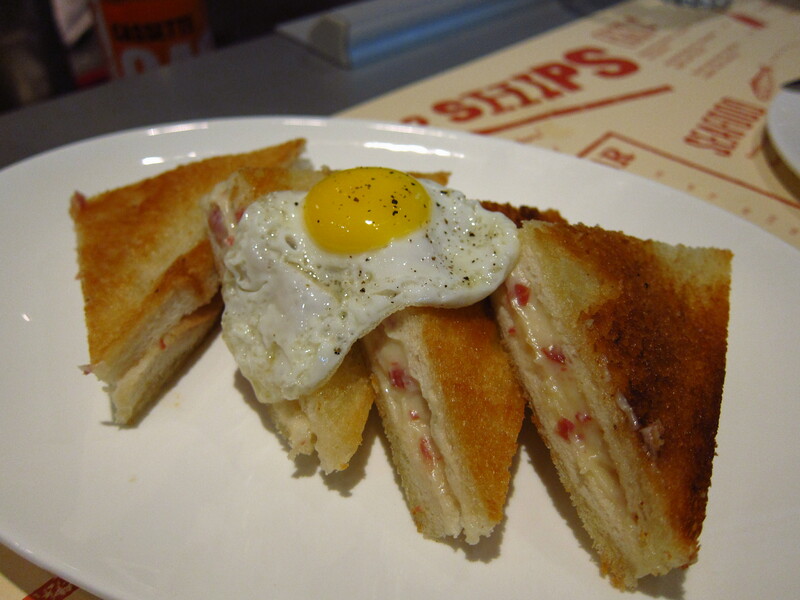 We were curious about the Manchengo cheese and Iberico ham toastie and were delighted to find four perfect toastie triangles with a comforting, beautiful, creamy filling of cheese, bechamel sauce and ham topped with a fried quail’s egg. 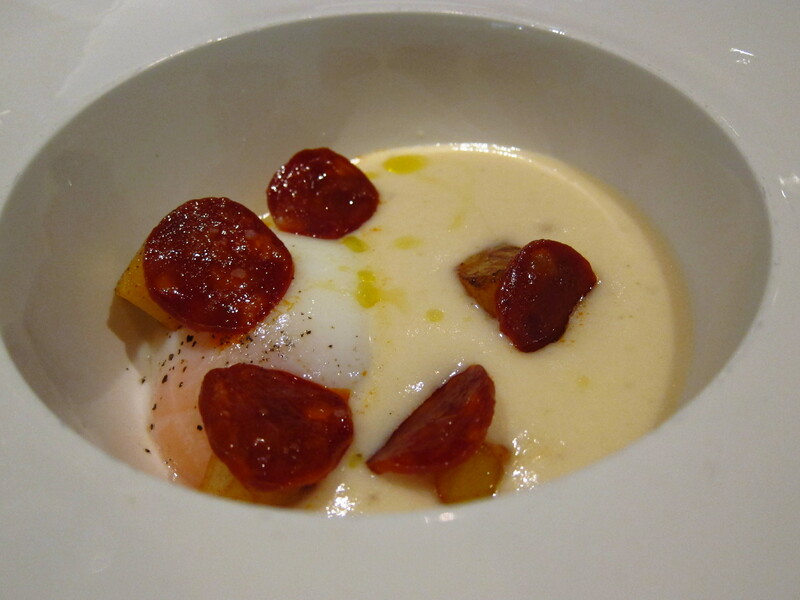 Having got off to a good start, our meal continued with the arrival of the Spanish breakfast with chorizo and potato. Whilst the flavours in unison were excellent- the tomato puree’s tanginess meshing well with the chorizo’s picante kick and the poached egg, there was little of this explosive flavour and the potato was overly smooth, leaving the dish under-textured for my liking. Moving onto seafood, and we treated ourselves to the marinated hamachi with gazpacho dressing and the miso grilled mackerel with wasabi avocado and cucumber chutney. The hamachi was a fine but small dish. 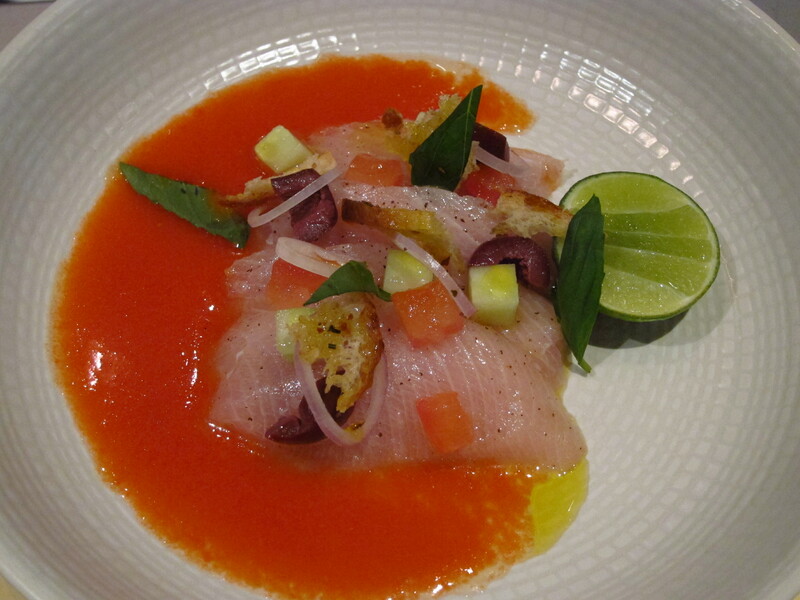 The slices were of a good thickness and the gazpacho had a refreshing tang which, coupled with the sliced black olives and the red onion gave the hamachi an added dimension. We loved the mackerel with its perfectly charred edges and crisp skin. The flesh peeled away beautifully and hints of miso enveloped the fish while the mild wasabi avocado puree made for a pleasant but not entirely impactful accompaniment. Meat was definitely on the agenda that night, but I felt that we needed to try at least one vegetable dish. 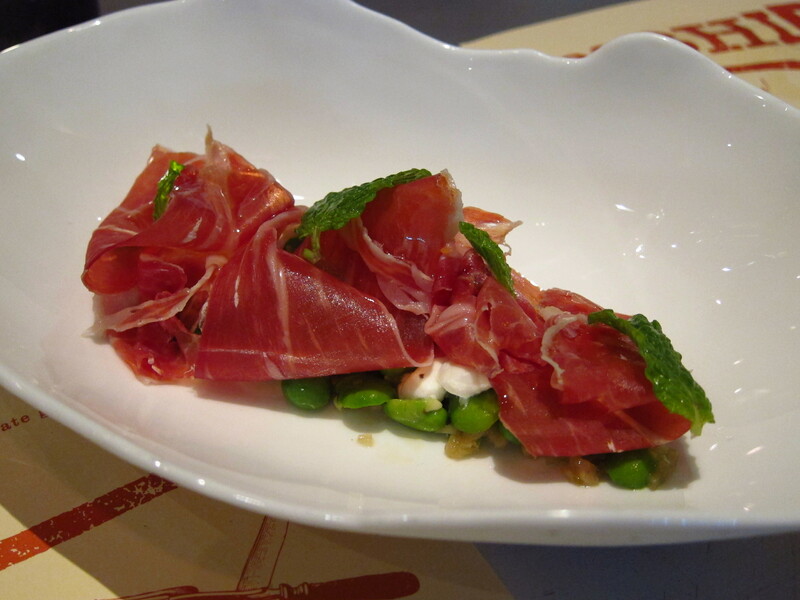 My eyes fell upon the peas, broad beans, goats curd, Iberico ham and mint dressing on the menu and when it arrived I was impressed by this seemingly simple dish. I loved the wafer thin Iberico ham and the cool, clean taste of the mint against the sweetness of the peas and the tartness of the goats curd was wonderful. But the real stars of the menu are the meat dishes. 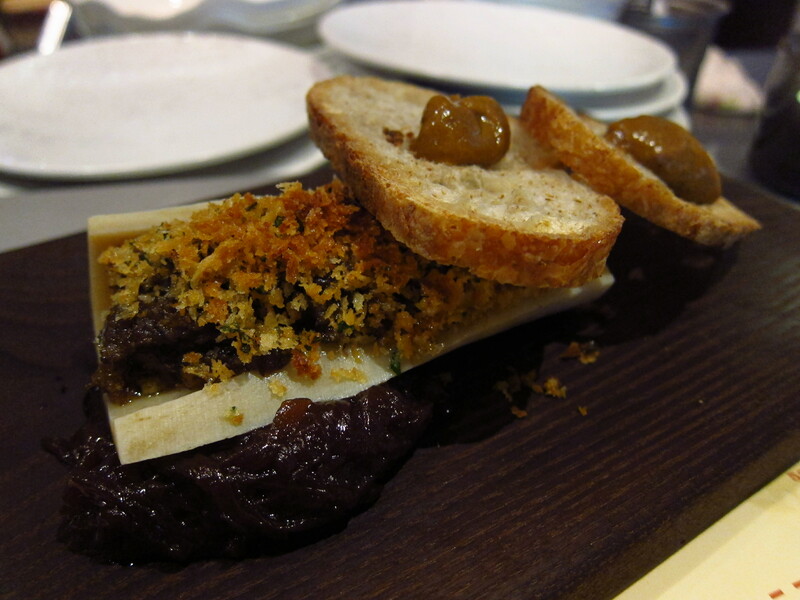 The baked smoked bone marrow with onion jam and sourdough and gentleman’s relish butter was a truly masterful dish. The aromatic bone marrow, scraped out and breadcrumbed before being nestled back into the bone was divinely soft and rich. I gleefully spread a heap onto my sourdough crouton and relished the rich taste of the marrow with the sweet, caramelised onion. 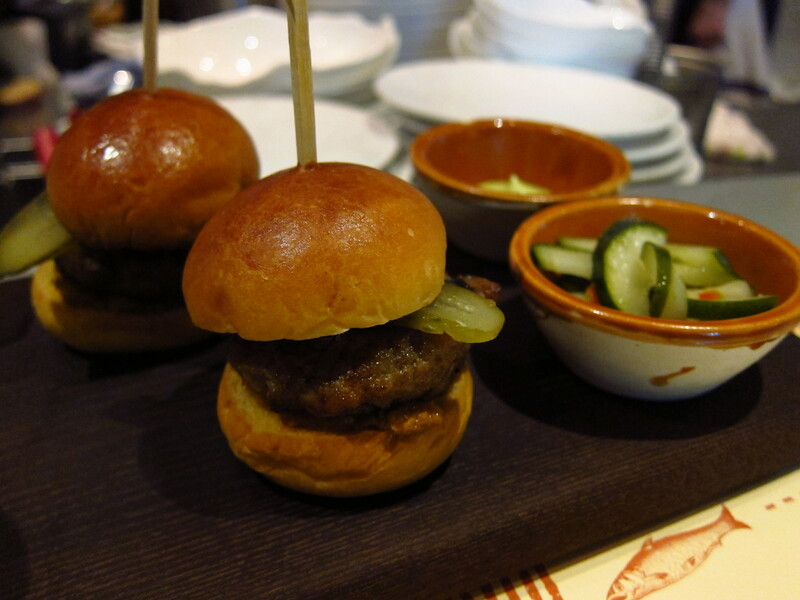 Who can resist the pull of mini-burgers, especially when they’re Char-grilled Iberico pork and Foie gras ones? Another first-rate dish, this was foodie heaven for me. The patty was juicy, thick and full of flavour, with the gherkin creating a great crunch. I especially liked the way the creamy avocado dip balanced out the richness of the burger. I later used up the rest of the avocado dip with the garlic fries which were extremely moreish! The roasted lamb cutlets and the suckling pig were the mostly generously sized dishes of the night and went down a treat with our party of four. The lamb was amazingly succulent and the spiced olive marinade paired splendidly with it, curbing the fattiness of the lamb. The suckling pig’s skin was to die-for. So crisp and full of sinful, fatty goodness, I would have happily eaten a whole plate of the skin alone. 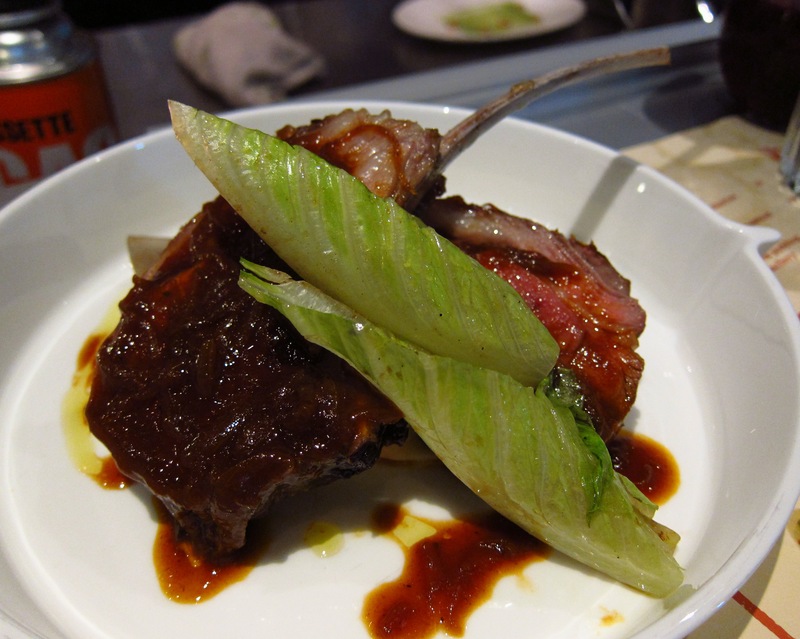 The meat mustn’t be disregarded though; it fell off the bone and was mouthwateringly tender. 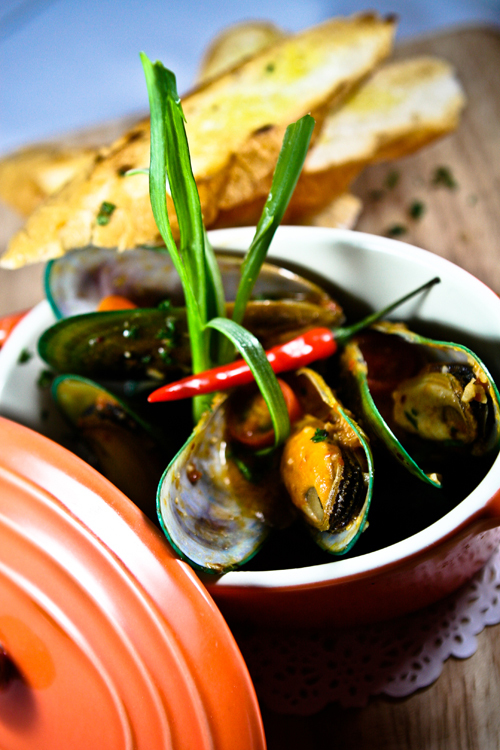 Definitely a dish to be savoured. At this point, we were starting to get meat sweats, but the desserts were too tempting so we had three. The ‘PBJ’ peanut ice cream with salted pea-nut caramel was a medley of sweet, sour and salty flavours, which can be a little overwhelming for the palate at first. The cherry sorbet was a very refreshing counter balance to the peanut ice cream and we all enjoyed the pop of salt at the end of the mouthful. The Olive oil brioche with chocolate ganache and sea salt was an interesting combination. The nuttiness from the brioche was overpowered slightly by the bitter edge of the chocolate and there was too much sea salt to really even out the flavours on the taste-buds. 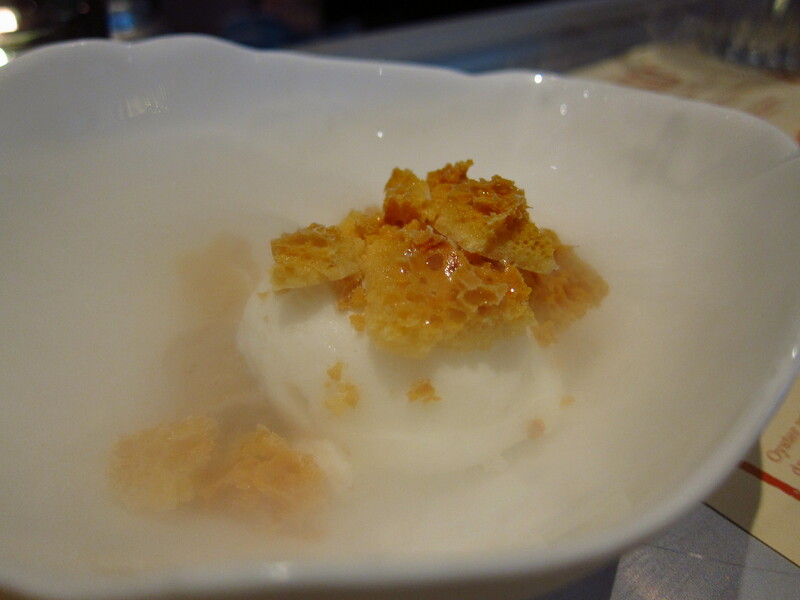 The last was the intriguing goats cheese sorbet with honeycomb and sweet walnuts. This was a little too adventurous for two of my dining companions, and I have to admit, even as a goats cheese lover, this packed quite a goaty, tangy punch. 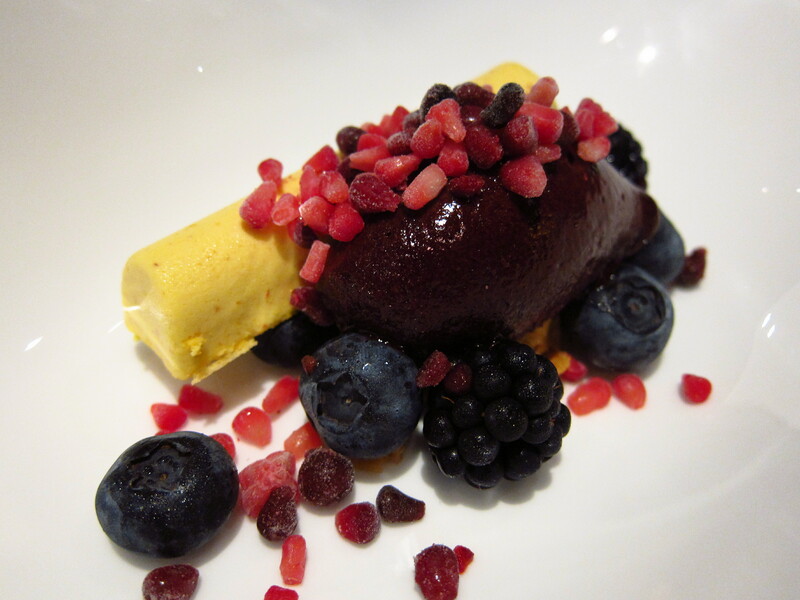 While I commend the effort and the exciting dry-ice effect on presentation, the honeycomb and the sweet walnuts were not enough to combat the sharpness of the sorbet. 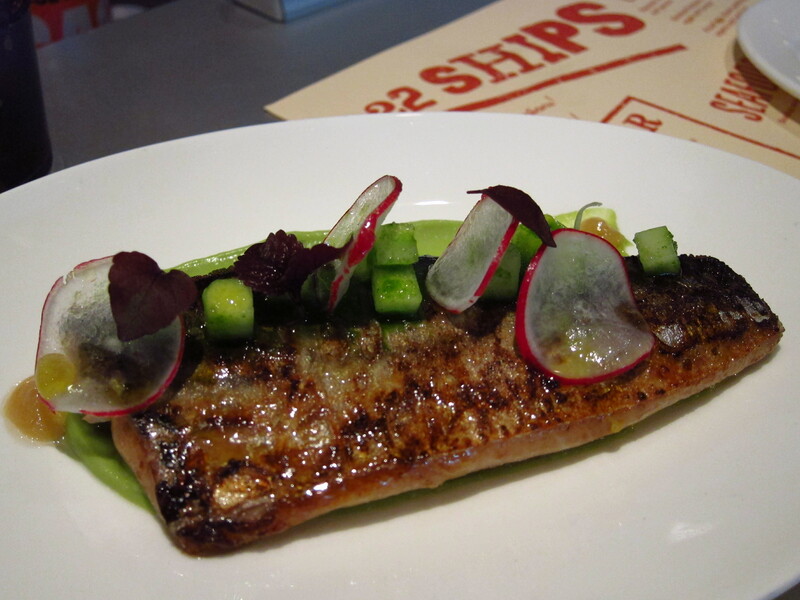 22 Ships is sailing in the right direction with efficient, knowledgeable staff and some outstanding dishes. The no reservation policy may be problematic for large groups and I’m concerned that with the kitchen’s attention to detail (which is of course, fantastic and a must), and the lack of a table time-limit, turnover could be slow. We also found that the portions, for the most part, were on the small side for their prices, with our meal setting us back $500 per head. Despite this, Atherton has brought to Hong Kong a fresh take on Spanish tapas and whilst I wouldn’t peg it as budget-friendly, I would encourage diners to have 22 Ships on their list for this month. You can also see this review on Sassy. Categories: Spanish | Tags: 22 Ships Hong Kong, Ferran Adrià, Gordon Ramsay, Hong Kong, Jason Atherton, Pollen Street Social, Ship Street Wan Chai, Spanish Tapas, Tapas, Wan Chai | Permalink. I can assure you I was not confused, nor did I have a tipple, but what I did have was a joyous hour or so reclining on one of the back sofas on the pool table floor, nibbling on a delectable selection of dishes from Hyde’s new tapas menu. For a short time only, you can have 3 dishes for $99 or 6 for $188, which is a great deal judging by their portions. In most tapas joints I find that their portions are created to tease the customer- not enough on the plate to quench the craving, but to order an extra plate would seem glutinous or frivolous, especially as the prices aren’t exactly cheap. But in Hyde, they are a lot more generous, which deserves a good thumbs-up from me. It’s a rather nice concept. Hyde creates an intimate chilled-out vibe for social drinks and snacks, and then transforms itself into a hub of raucous drinking and dancing. As well as the tapas (available from noon daily), at lunch you can also have a light meal for $78 which includes a soup, salad, dessert and coffee or tea, or you can have the full course menu at $98 for soup or salad, mains, dessert and coffee or tea. 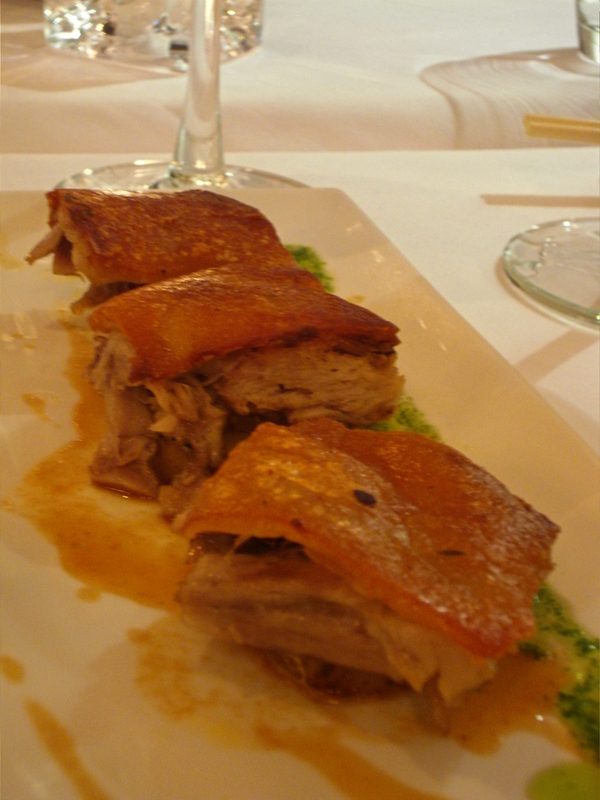 I started off with the slow roasted crispy pork belly with spicy sauce and mint sauce. Cooked for 3 hours (so they say), then grilled to attain the crispy crust, it was moist and tender and the crunchy fat was delicious. The sauces were particularly good, though you don’t really need to dip the pork in them, or rather, you will forget that the sauces are there and keep chomping away. The Chuletas de Migas (NZ lamb cutlets coated with Dijon mustard and basil crumbs) was fantastic. Juicy, well seasoned lamb cutlets are my weakness and if it weren’t for my snacking companion (Hyde’s wonderfully helpful Events lady, T) I would have scoffed both cutlets and gnawed them to the bone. But obviously conscious of maintaining my naturally dainty and lady-like eating persona, I refrained from such cave-man behaviour. 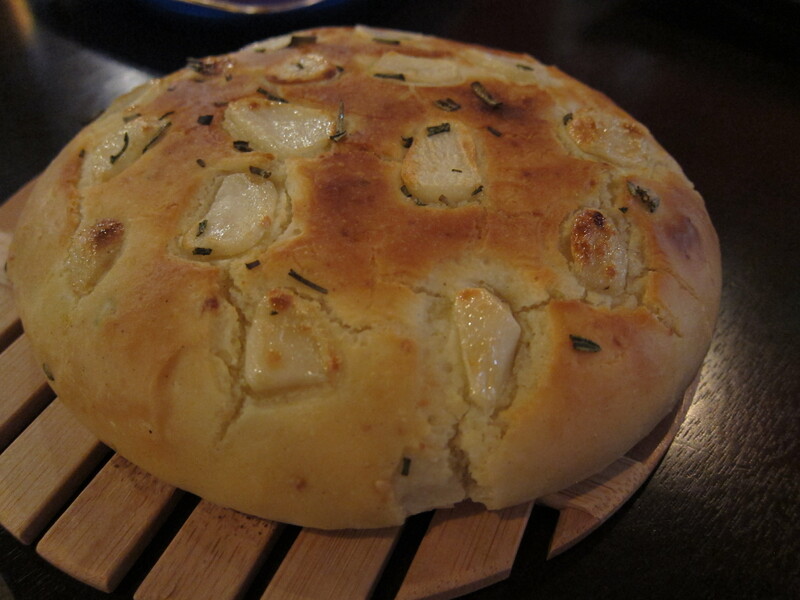 An interesting dish was the Hyde fusion loaf. A homemade bread stuffed with Portobello mushroom, bell pepper and feta cheese pesto, it made for an unusual addition to an otherwise fairly traditional tapas menu. It’s quite heavy, so if there are only two of you, try to even out your dishes with something lighter and less carb-laden. The Tortilla con chorizo was standard and a bit on the soggy side, mostly due to, I think, too many ingredients- baby spinach, chorizo and cheese. I prefer plain tortilla with no embellishments as I find that the omelette stays firmer that way and has more depth to it. 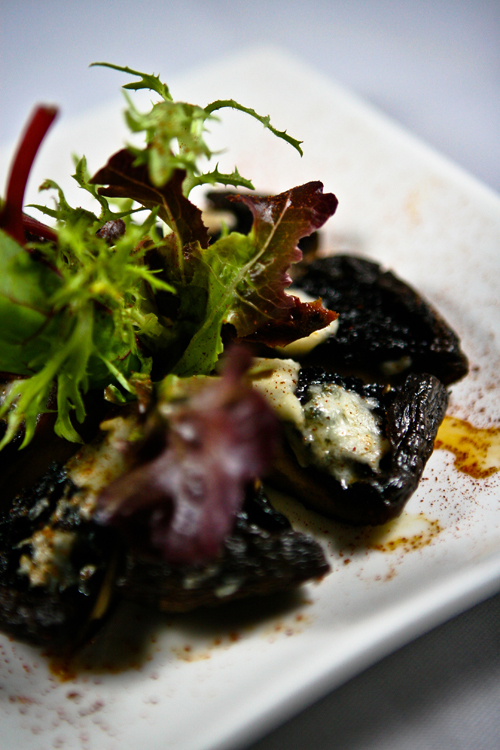 The baked Portobello mushrooms with melted gorgonzola blue cheese was quite good, but stay away if you think blue cheese is like Satan’s mould, as it is pretty pungent and strong. The last two dishes- the lemon chicken on couscous and the Provencal mussels were of a high standard, both with sufficient amounts of sauce to be mopped up with the Fusion loaf. 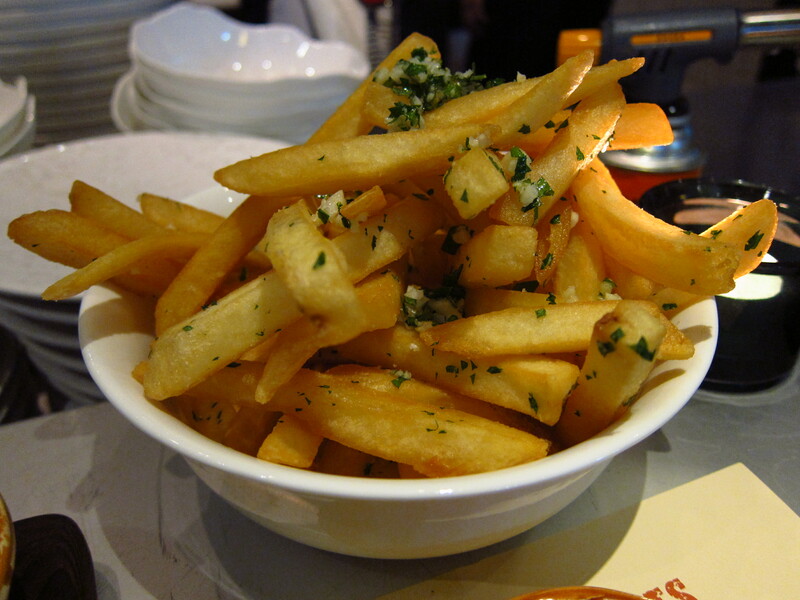 As I’m a greedy guts, I couldn’t resist requesting the Truffle fries which were lovingly tossed with truffle meat and steeped in truffle oil. I couldn’t finish them so I took them home in a doggy bag. Trufflelicious! Hyde has a selection of Spanish wines on the menu that have been carefully chosen to be paired with the tapas. This is especially useful for those of us who haven’t a clue what is an appropriate wine to have and end up ordering the bog standard Pinot Grigio. So, considering I didn’t know Hyde even served food, I was pleasantly surprised. Their food is good and filling for the price and quite honestly, 3 dishes is more than enough for two people craving a hearty snack. A very comforting prelude to an evening out. 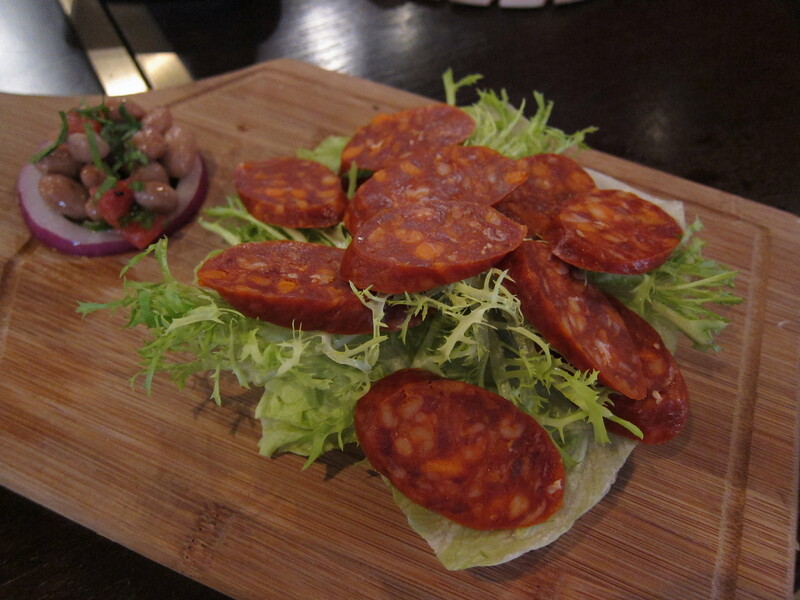 Categories: Spanish, Western | Tags: Central Hong Kong, Hyde, Lyndhurst Terrace Hong Kong, Spanish Tapas | Permalink. 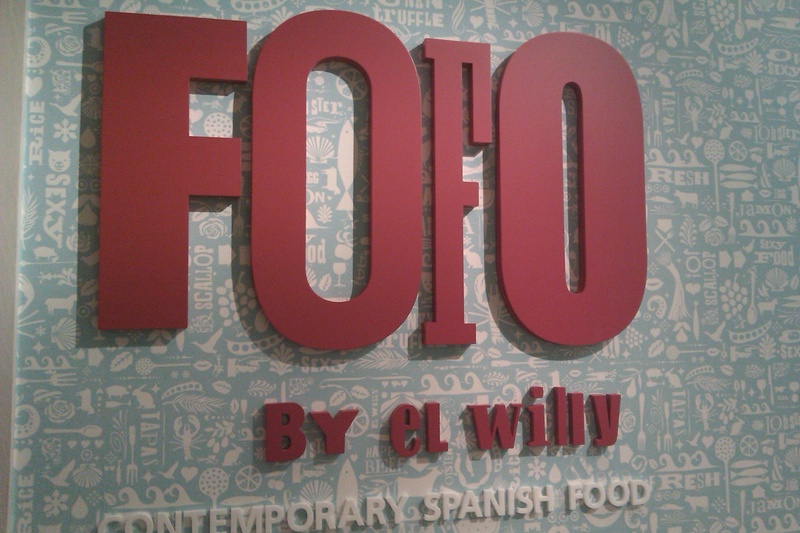 Sometimes, it’s all in the name, and Fofo is a brilliant moniker, especially as it means ‘fat’ in Spanish. 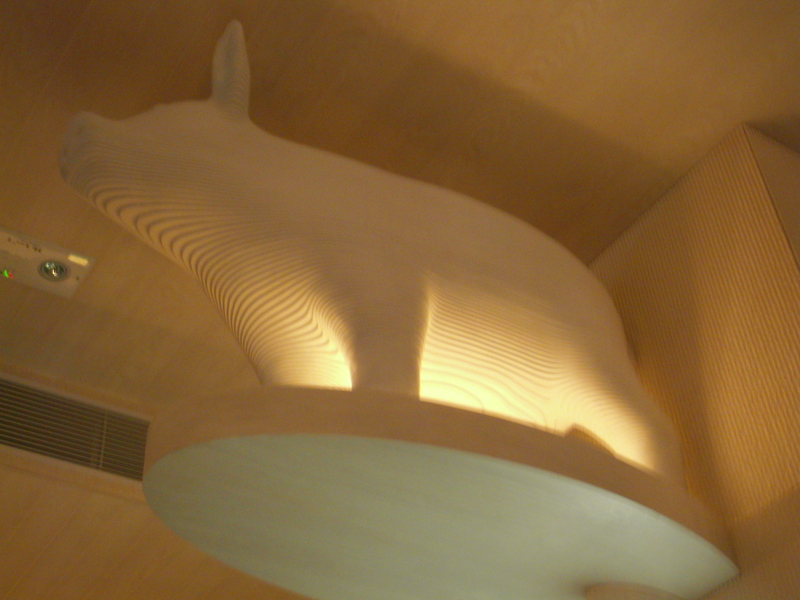 Situated on the top floor of the M88 building in Central, with amazing views of Hong Kong , diners are greeted by a massive expanse of white and quirky casts of roly-poly pigs and penguins. Whether Guillermo ‘Willy’ Trullas Moreno, the man behind Fofo, intends the name to be a reference to how we feel after we’ve eaten there or for those who want to reach new heights of satiety after a ‘pig out’ (haha), is anyone’s guess, but if you’re a fan of Spanish tapas, then make your way over. Specialising in tapas with a contemporary edge, the original Fofo resides in Shanghai and is run by ‘Willy’, whereas the Hong Kong branch (which opened a year ago) is overseen by Chef Alex Fargas, hailing from Barcelona, who successfully recreates and delights Hong Kong crowds with Willy’s most popular dishes. My friends and I had specific dishes in mind to try, following the recommendations of others and those that made the list were the scallop cervicho, lobster paella, pan fried chorizo, the tortilla and the roast suckling pig. We also asked for a big jug of sangria, a mistake as we glugged it like Ribena! We started ‘healthily’, asking for the king crab salad, which was delicious, refreshing, and piled high with lots of crab meat. The scallop cervicho, served with crispy shallots, looked a lot blander than I expected, but the taste was delicate and clean. 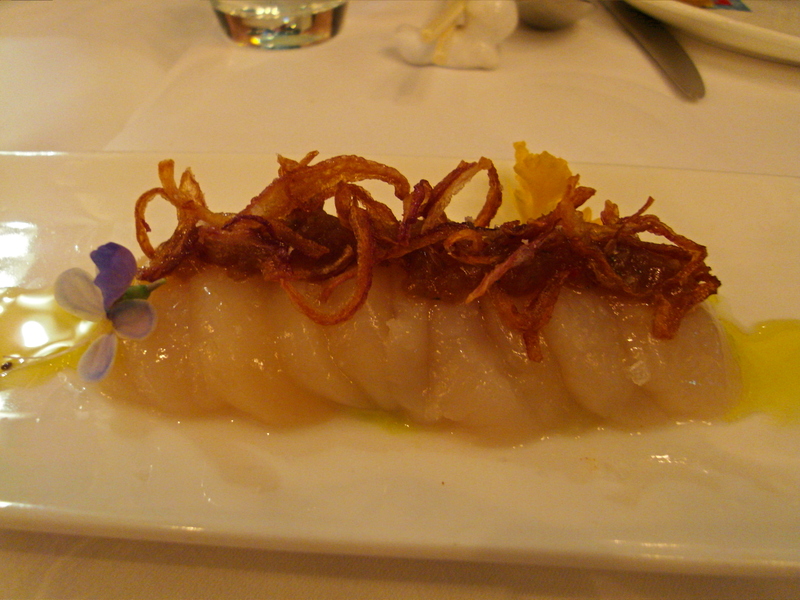 The fine texture of the scallops was nicely offset by the crunchy shallots. 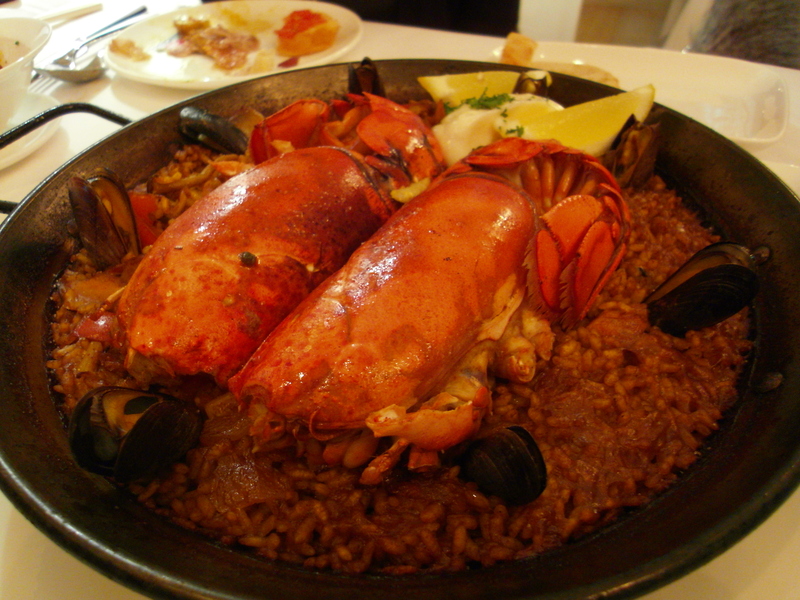 The lobster paella was beautiful. The presentation was impressive- the whole lobster lying formidably on the paella made me think I had to break into a fortress to get to my food! The rice was perfectly al dente, not too hard, and not mushy, and the garlic mayonnaise it was served with completely transformed the taste. The flavours were heaven to my palate. The chorizos were so addictive. Salty and wonderfully crisp on the edges, chewy on the inside- scrumptious! 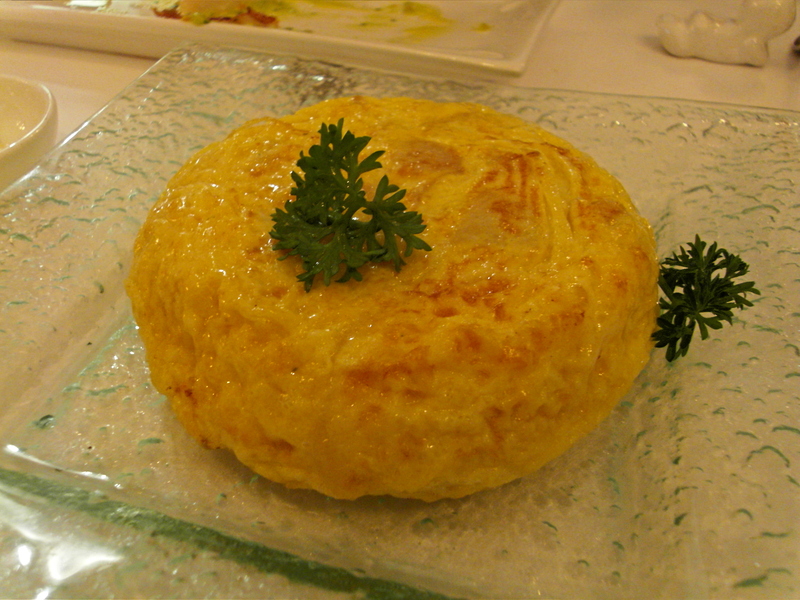 My favourite Spanish tapas dish of all time is tortilla de patatas, an egg omelette with fried potatoes and onions. I could honestly eat plates of the stuff and never get enough, so it was important to me that Fofo’s tortilla passed the test! When it arrived, I was excited. A wonderfully prepared round and thick omelette gazed at me and when our forks cut through it, lovely layers of potatoes were revealed. A delicious yet simple dish. The most anticipated dish of the evening was Fofo’s signature roast suckling pig. The crispy skin was exquisite, the meat tender, but the portion was a bit on the small side. So if there are more than 4 of you, you should order 2 plates. 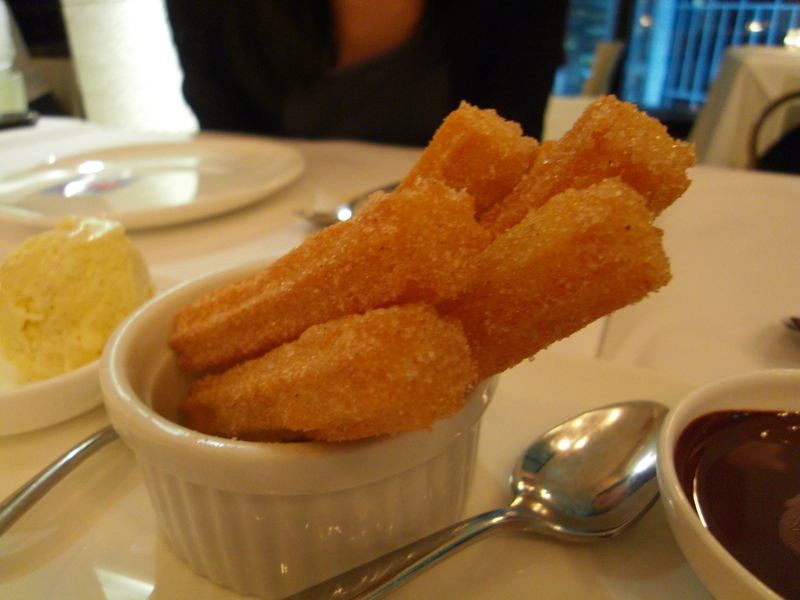 To end on a sweet note, we had the excellent churros served with hot dipping chocolate. This Spanish doughnut is such a moreish snack, even more so when fresh out of the oven. There were many other dishes on the menu, such as the black truffle risotto, Iberian ham and organic eggs served with foie gras and truffle that I wanted to sink my teeth into, but that will have to be on my next visit! Overall, a fantastic dinner with great service, and to top it all off, Chef Fargas stepped out of the kitchen at the end of the night and stopped at every table to make sure we enjoyed the food. A lovely added personal touch from a polite, smiley and obviously talented man. You made my taste buds happy and I definitely felt fofo! Categories: Spanish | Tags: Central Hong Kong, Chef Alex Fargas, churros, Fofo by el Willy, Fofo Shanghai, Guillermo ‘Willy’ Trullas Moreno, Hong Kong, paella, roast suckling pig, scallop cervicho, Spanish Tapas, tortilla de patatas, Wellington Street Central Hong Kong | Permalink.